Needless to say, it’s been a wild ride this quarter for investors here and abroad. With markets having round-tripped this quarter from the depths of double-digit percentage losses to essentially breakeven on the quarter, we thought it would be a good time to look underneath the hood and see which sectors and corners of the market are driving indices higher, and which ones are showing cracks. All of the relative strength charts we follow are included below, as well as some quick takeaways. All sector relative strength data is computed using the sector MSCI World sub-indices vs. the overall MSCI World. Upward movement in the sector charts indicates outperformance relative to the benchmark and vice versa. 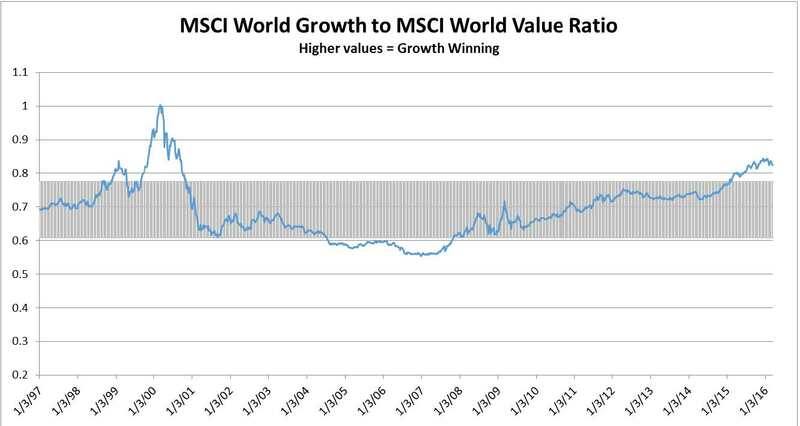 Historically, value stocks have outperformed growth stocks. But, like everything else in markets, trends move back and forth over time. Since the financial crisis, growth stocks have had the upper hand to an extent not witnessed since the late 1990s when growth-y new internet stocks were all the rage. 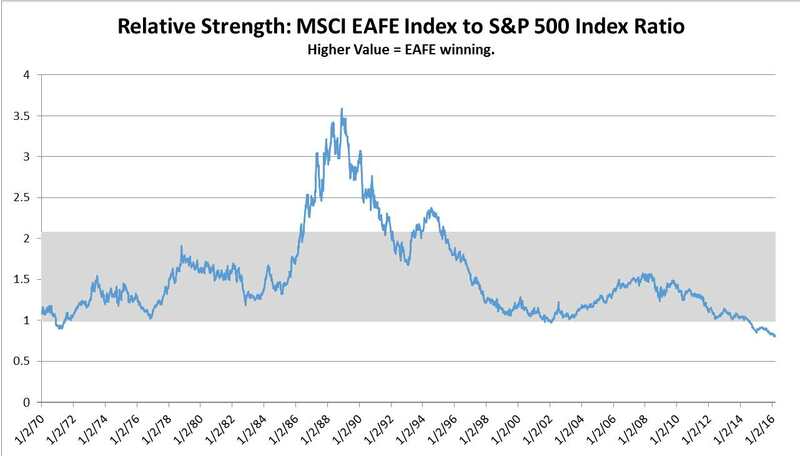 For the first time in a few years at least, value is showing it can hold it’s own, at least for a little while, as shown in the first chart below. 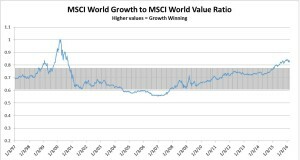 Coming into today, the MSCI World Value index is -2.37% versus -4.54% for the growth index. We still believe that growth’s relative performance stretch is in the later innings and that its time for value to reassert itself, as it’s done in past instances when relative strength became this stretched. A similar situation has unfolded over time with international stocks in Europe and developed Asia. 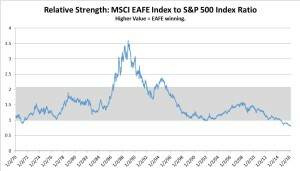 After significantly outperforming the S&P 500 over a 20-year period from 1970 to approximately 1990, the MSCI EAFE has given back all of that relative strength, and then some. With international equities now trading at valuation levels decently lower than the S&P 500, it may be time for this trend to reverse as well. No such reprieve this year so far, though, with the EAFE -5.50% coming into today versus -2.19% for the S&P 500. 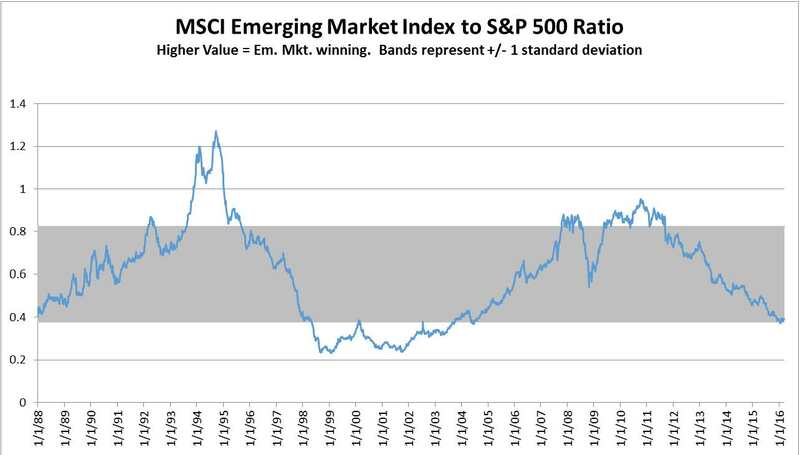 Ditto for the emerging markets index, which has substantially lagged US stocks since the financial crisis. Relative strength has now declined to levels last seen at the tail end of the late-1990s Asia and Russia driven emerging markets crisis. 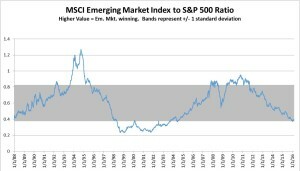 One positive note: the MSCI EM index is now trading below 10x using normalized earnings, far below US valuation levels, one of the factors leading us to believe that we’re witnessing the late innings of the emerging market performance debacle. So far this year, the emerging markets index is showing signs of relative performance life; the index is essentially flat on the year heading into today. The Consumer Discretionary, IT, and Health Care sectors have been the best sectors in terms of relative performance since the depths of the financial crisis. Energy, utilities, and materials have been the worst relative performers since that time. The energy sector index is only up 21% since March 2009 versus a 129% gain for the overall MSCI World (price return, without dividends calculated). Since the sector data begin in January 1995, the Consumer Discretionary, Consumer Staples, IT, Health Care, and Energy indices have outperformed the overall index while the Materials, Financials, Industrials, Utilities, and Telecom indices have underperformed. Health care, IT, and Consumer Staples (surprisingly) have been the best performing indices overall relative to the index over the past 20 or so years. The Financial sector has been the runaway worst performer over the past few decades, followed by the telecom sector, which was decimated during the dot-com bust, and boring ole’ utilities. Consumer Discretionary and Healthcare have shown some cracks recently after their multi-year outperformance runs. Both have shown cracks at various points, though, in recent years, only to regain their footing and reassert their primacy. Consumer Staples stocks showed solid relative performance during and through the recent correction, as one might expect from a more defensive sector. Of course, over the past 20 years, nearly every time the Staples sector takes a relative performance leg up during a challenging market period, it’s been able to hold its own after corrections as evidenced by the fact presented above that Staples is the third best performing sector since early 1995. The Telecom sector has begun to show some relative performance life in recent months, though it looks like a blip against the very challenging historical record. As we’ve mentioned in the past, the Telecoms RS chart below could present a cautionary tale for those expecting financials to begin outperforming sooner rather than later. Since the dot-com collapse in 2000/2002, Telecoms have never been able to find sustained outperformance. Reversion to the mean? Not here, at least not yet. The Energy sector has produced the biggest relative performance round-trip of the bunch. Energy investors were feeling pretty darn smart between 1995 and 2008. Since then, they’ve been brought back down to earth.